Puglia (or Apulia) is the long strip of land, 400km from north to south, that makes up the "heel" of Italy. 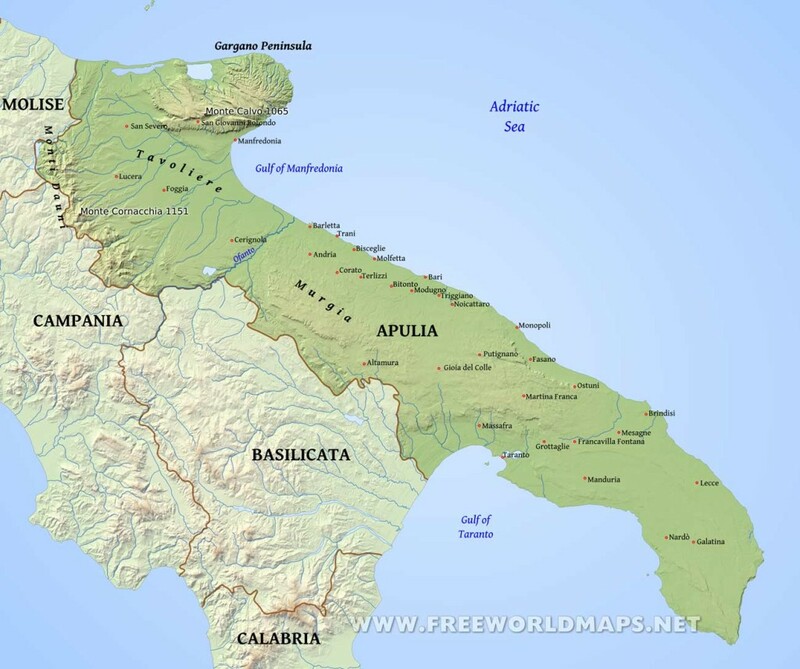 Puglia was for centuries a strategic province, colonized, invaded and conquered (like its neighbors, Calabria and Sicily) by just about every major power of the day, from the Greeks through to the Spanish. As elsewhere in the South, each ruling dynasty left its own distinctive mark on the landscape and architecture – as seen, for example, in the surviving traces of Roman agricultural schemes and the fortified medieval towns. There’s no escaping some of the historical influences in Puglia. Perhaps most distinctive are the Saracenic kasbah-like quarters of many towns and cities, the one at Bari being the biggest and most atmospheric. The Normans endowed Puglia with splendidly ornate cathedrals; there’s one at Trani which skilfully blends many strands of regional craft traditions from north and south. And the Baroque exuberance of towns like Lecce and Martina Franca are testament to the Spanish legacy. But if there’s one symbol of Puglia that stands out, it’s the imposing castles built by the Swabian Frederick II, all over the province – foremost of which are the Castel del Monte and the remnants of the palace at Lucera. Clean seas and reliable sunshine have made Puglia a popular spot for holidays, with acres of campsite-and-bungalow type tourist villages – as well as a large number of flashy four-star hotels – principally serving tourists from Italy and Germany. The cities, however, including Bari, have little that’s characteristic enough to warrant long stays: Taranto and its surroundings have fought a losing battle with the local steel industry, while Brindisi is known and visited only for its ferry connections with Greece; even Lecce has little to hold you once you’ve trekked your way along modern boulevards to see the crazed confectionery of its Baroque churches. Nevertheless, there’s a geographical diversity to Puglia that can be very attractive, though to get to the best of the province you either need your own transport or the patience to use the often erratic local buses. The very southern tip, the Salentine peninsula, is rocky and dry, more Greek than Italian, while there’s plenty of barren mountain scenery in the undulating plateau of Le Murge, in the centre of the province. The best escape, though, is north to the mountains, forests and beaches of the Gargano promontory with some of the finest unpolluted sand and sea to be found anywhere on the Adriatic. Getting around Puglia by public transport is fairly easy, at least as far as the main towns and cities go. FS trains connect nearly all the major places, while small, private lines head into previously remote areas – in the Gargano and on the edges of Le Murge. Most other places can be reached by bus, though as ever services are often infrequent or inconveniently early – a problem that can only really be solved by taking, or renting, your own car. Incidentally, if you’re on your way to Greece, it’s worth noting that you don’t have to leave from Brindisi: there are also departures from Bari and from Otranto, south of Lecce. Lonely Planet Southern Italy is your passport to all the most relevant and up-to-date advice on what to see, what to skip, and what hidden discoveries await you. Wander through Pompeii, a town frozen in time, wake up to the sound of a Neapolitan street market, or gaze at the Mediterranean, all with your trusted travel companion. Get to the heart of southern Italy and begin your journey now! The Perfect Choice: Lonely P lanet Southern Italy, our most comprehensive guide to Southern Italy, is perfect for those planning to both explore the top sights and take the road less travelled. Looking for a guide focused on a specific destination in Southern Italy? Check out Lonely Planet’s Naples, Pompeii & the Amalfi Coast guide or Sicily guide for a comprehensive look at what these areas has to offer. Authors: Written and researched by Lonely Planet, Cristian Bonetto, Gregor Clark, and Helena Smith.